"They were talking about some issue that had nothing to do with the campaign, but the first call they took was from one of our guys... That person called into the radio show and challenged John's integrity, and then John decided not to get in the race. And that was a huge victory for Rob. We kept John out and Rob won because of it." - Rob Ford's campaign manager Nick Kouvalis taking credit for convincing John Tory not to enter the mayoral race. "There should be no hesitation in coming downtown any more." - Alan Whitfield, general manager at the Harry Rosen on the recently completed Bloor Street beautification. "You see a lot of motorcyclists nowadays wearing reflective wear when they're riding around even in the daytime. Is it really too much to ask for pedestrians at nighttime?" - Sergeant Tim Burrows on pedestrian safety strategies and fashion crimes. "My dad's not racist, his best friend is black." - Blair Crowley's son on his father's choice of Halloween costume, which put Northumberland county in the spotlight for much of the week. $350,000 - The amount of debt held by the Rob Ford campaign. 18,000 lbs - The weight of food that magician Scott Harnell was able to raise by making himself "disappear" in a glass box (surrounded by the food, of course). $275-million - The budgetary surplus reported by the mayor's office for 2010. $857-million+ - The most recent estimate of the total cost of the G8 and G20 summits, which is significantly lower than the $1.3-billion set aside for the events. $100,000 - The original cost of Michael Hayden's Arc en ciel light installation at Yorkdale station, which might just be rebuilt. 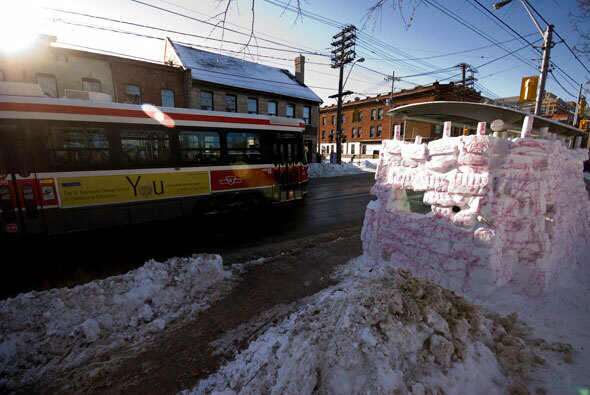 Although Toronto's only experienced a couple instances of flurries so far this month, the days in which creations like this one are possible are on the horizon. Being such a YouTube junkie, I'm not sure how I missed this one when it came out, but it's worth a look if you've ever wondered how ink was made. The video was produced by Toronto-based Vepo Studios and was shot at the Printing Ink Company just north of the city in Vaughan.